CERV96 wrote: Wow, I figured it would be lower than that. They're only 13 points ahead of the pens. Add in a couple points for the bubble teams in the west being a bit higher than those in the east, and a 10 point gap between Pittsburgh and Chicago magic numbers make sense. True - 9th (and 10th) max in the west is 76, while 9th max in the east is 73. Pens and Jets both play tomorrow, and a Jets loss keeps them ahead of the Isles. Could drop up to 4 tomorrow if I did my math right. It's 33, ********. Too drunk to find a #33 picture. Perhaps soneone can do a photo. Nevermind, I got it. Zalapski is an easy choice. Let's go with Cairns. think it might be 32 though. Toronto is now 9th most max points at 71. Pens with 40 points requires 31 + 1, or 32. If the Peg beat the Leafs in regulation tonight, it will drop to 28.
good problem to have to have an effective 8 point lead over the Debbies and 10 over the Rags (assuming they would win their two games in hand) with 19 games to go. Should be 27, as the other games today won't affect the 9th most max. EDIT: Think division MN is the same right now, as the Devils and Rangers both max out as 70 max points, which is also the 9th most total. Rangers play the Devils tonight, so the magic number will drop by 1 at a minimum. Could go down by as much as 4 this evening. 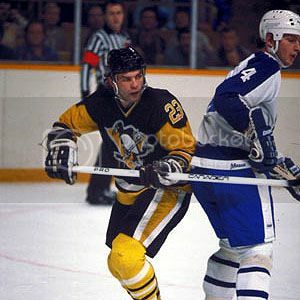 Wanted to find an Endicott picture when he wore 23. Couldn't do it. Try and picture it, as painful as it is. Division MN only falls to 25 though, due Rangers win. Thought it still at 21?